Yes, I am your typical Jersey girl that loves everything pumpkin! Plus everything bite-sized! I have made several recipes that are bite-sized so they are easy to grab and go snacks - as we are all always on the go these days! 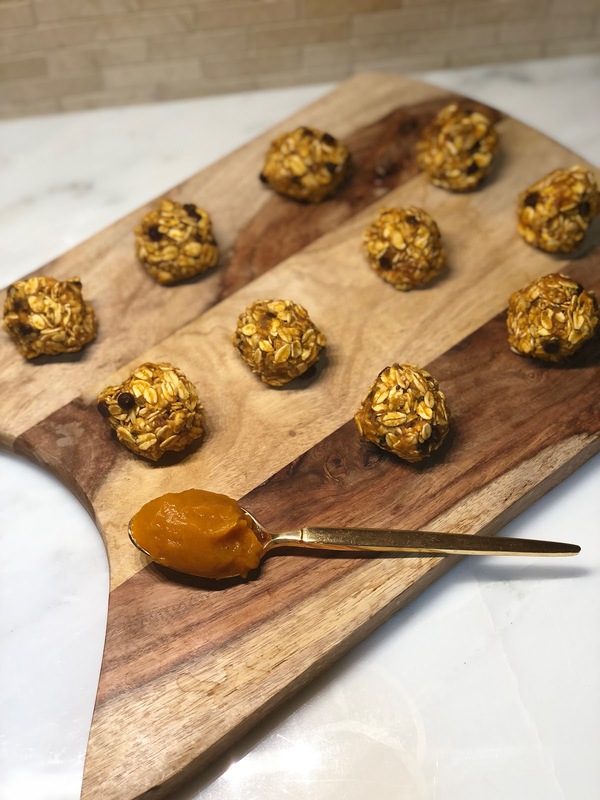 So I upgraded my fit bites to add in pumpkin to make......Pumpkin Fall Balls! Of course you can switch up the ingredients to your liking, think flax seeds, other nut butter, pumpkin seeds...... you get the drift! Depending on the size of the balls that you make you can get up to 14 - be mindful of the size for as these are calorie dense - but still a healthy treat! I keep them in the fridge and we all grab and eat them as we feel the need to. I throw them in my kid's lunch box too! 1. Mix all ingredients in one bowl. 2. Option to place mixture in the fridge for about 10-15 minutes to firm up. 3. Roll into balls and keep in the fridge for a few days. Healthy Mini MuffinsSchool is back in session and the abundance of snacks are too! Honestly, there are always snacks in our house though! My kids have had those infamous mini bite muffins in the past (before I realized what reading ingredients meant lol!) and of course, when they see them in the store they try to sneak them into the cart! They know I will no longer buy them but they like to mess with me! While I have been experimenting with different back to school snacks I thought why not make my own mini muffins?! 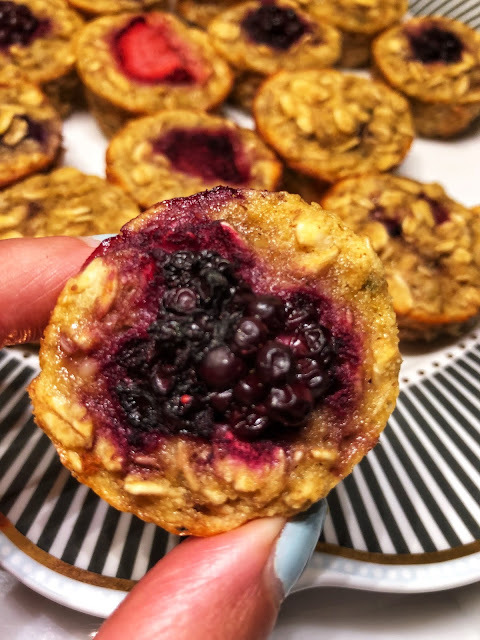 I have many recipes with full-size muffins like my Superfood Chocolate Chip Muffins, Fresh Blueberry Oatmeal Muffins, or my Healthy Banana Apple Muffins. But nothing mini?! I know these will be easier to just pop in and eat for the kids so mini's were created! 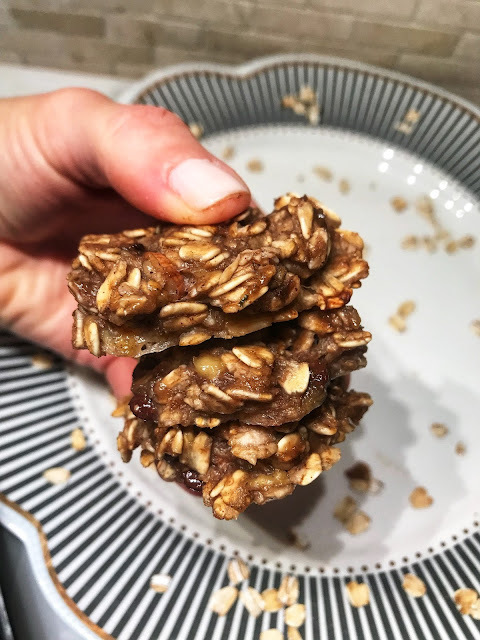 Healthy Banana Oatmeal CookiesI love these cookies when looking for a healthy treat - especially for the kiddos! With only a few ingredients (that you may have on hand too!) these are super simple to whip up real quick and great for an after-school treat for your kids and friends! With 1 cup of old fashioned gluten free oats, 2 ripe bananas (don't throw those brown ones away!!) and some yummy add in's! I went with chopped almonds, hemp seeds, cinnamon, nutmeg and a pinch of sea salt. Feel free to use your fav mix in's from mixed nuts, dried fruit, and other super seeds. These are super moist so best kept in the fridge. They will last a few days in there if they aren't gone first! Once all the ingredients are combined, measure out 1 tbs onto a baking sheet and bake for about 15 minutes. That's it! Super simple and healthy! That's how I like it! Don't forget to share with me on Instagram or comment below if you give them a try! Would love to hear from you! Healthy Peanut Butter CupsI think the title and the pic below about sum this one up and it is one you are going to want to try for yourself! I came across this awesome company Cocoa Bar in a Jar that had a chocolate peanut butter flavor made with coconut butter. Let's also mention that it is vegan, gluten-free and contains no soy! I knew I had to try some! I hate to say it but move over Nutella! lol! Not only is this one healthier but it truly tastes AH-mazing! 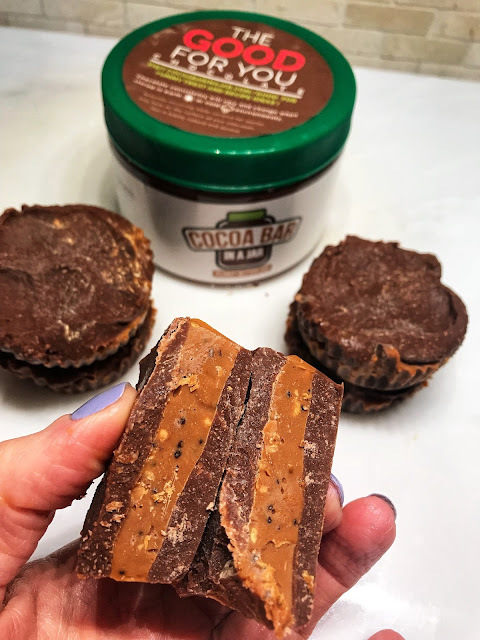 This recipe is super simple too as all I did was measure 1 tbsp of Cocoa Bar in a Jar in a muffin pan (with a liner) froze for 10 minutes, added 1 tbsp of Trader Joes Chia & Flax peanut butter (feel free to sub any nut butter you like! ), froze for 10 minutes, then topped with another 1 tbsp of Cocoa Bar in a Jar sprinkled a little sea salt and froze another 10 minutes. Bam! Such a delicious no-guilt treat!